Throughout history the horror of war has ironically created beautiful literature. 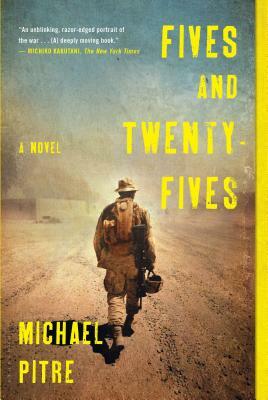 The latest entry to that canon is Michael Pitre’s Fives and Twenty-Fives, a mesmerizing debut set during Iraq War and its aftermath... This novel will rightfully take its place next to Matterhorn and Yellow Birds in the realm of modern combat literature. It's the rule--always watch your fives and twenty-fives. When a convoy halts to investigate a possible roadside bomb, stay in the vehicle and scan five meters in every direction. A bomb inside five meters cuts through the armor, killing everyone in the truck. Once clear, get out and sweep twenty-five meters. A bomb inside twenty-five meters kills the dismounted scouts investigating the road ahead. Fives and twenty-fives mark the measure of a marine's life in the road repair platoon. Dispatched to fill potholes on the highways of Iraq, the platoon works to assure safe passage for citizens and military personnel. Their mission lacks the glory of the infantry, but in a war where every pothole contains a hidden bomb, road repair brings its own danger. Lieutenant Donavan leads the platoon, painfully aware of his shortcomings and isolated by his rank. Doc Pleasant, the medic, joined for opportunity, but finds his pride undone as he watches friends die. And there's Kateb, known to the Americans as Dodge, an Iraqi interpreter whose love of American culture--from hip-hop to the dog-eared copy of Huck Finn he carries--is matched only by his disdain for what Americans are doing to his country. Returning home, they exchange one set of decisions and repercussions for another, struggling to find a place in a world that no longer knows them. A debut both transcendent and rooted in the flesh, Fives and Twenty-Fives is a deeply necessary novel. Michael Pitre is a graduate of LSU, where, as a double major in history and creative writing, he studied with Andrei Codrescu and Mark Jude Poirier. He joined the US Marines in 2002, deploying twice to Iraq and attaining the rank of Captain before leaving the service in 2010 to get his MBA at Loyola. He lives in New Orleans. Fives and Twenty-Fives is his first novel.